For fans of Nudge, Black Box Thinking and The Art of Thinking Clearly, a fascinating dive into the many ways in which competing truths' shape our opinions, behaviours and beliefs. There is more than one truth about most things. Eating meat is nutritious but it's also damaging to the environment. The Internet disseminates knowledge but it also spreads hatred. As communicators, we select the truths that are most useful to our agenda. We can select truths constructively to inspire organisations, encourage children, and drive progressive change. Or we can select truths that give a false impression of reality, misleading people without actually lying. Others can do the same, motivating or deceiving us with the truth. Truths are neutral but can also be highly versatile tools that we can use for good or ill.
Hector Macdonald here explores how truth is used and abused in politics, business, the media and everyday life. 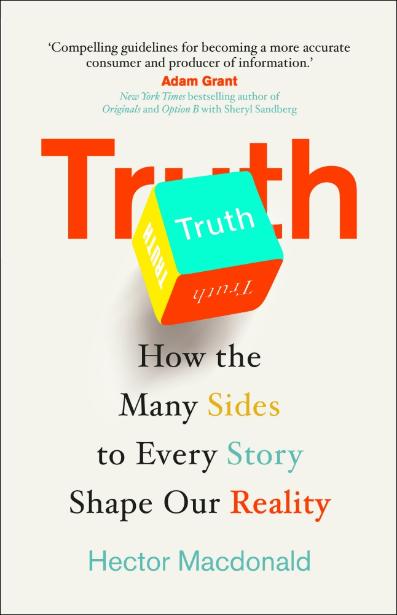 Combining great storytelling with practical takeaways and a litany of fascinating, funny and insightful case studies, Truth is a sobering and engaging read about how profoundly our mindsets and actions are influenced by the truths that those around us choose to tell.